But there are some steps in our water management process that are consistent from location to location. Here’s a look at water usage and water conservation at a typical mill, from intake to discharge. Water’s journey through the pulp- and paper-making process begins most often at a nearby river or lake. The water, which is often cloudy when withdrawn from the river, requires significant filtering and clarifying so that it is suitable for making high-quality pulp and paper. We need to remove debris, particles and chemicals that will damage manufacturing equipment. Our water filter plants are the first step to cleaning the water. Water is drawn through a bar screen to remove large debris, such as branches, sticks and, sometimes, trash. The water continues to flow through finer screens, removing leaves and other small debris. Next, the water is pumped to a raw-water clarifier where chemicals, such as alum, are added to remove suspended solids from the water. Other chemicals are added to adjust pH levels, prevent corrosion and scale, and control microbiology that might create slime. Finally, water travels through a sand filter bed (a much-larger version of a typical backyard-pool sand filter) for a final cleaning before collecting in a clear well or storage reservoir. It stays in the well until it is needed by various water users in the mill. Because of our careful water conservation and management plan, we can reuse water an average of 10 times in the mill. 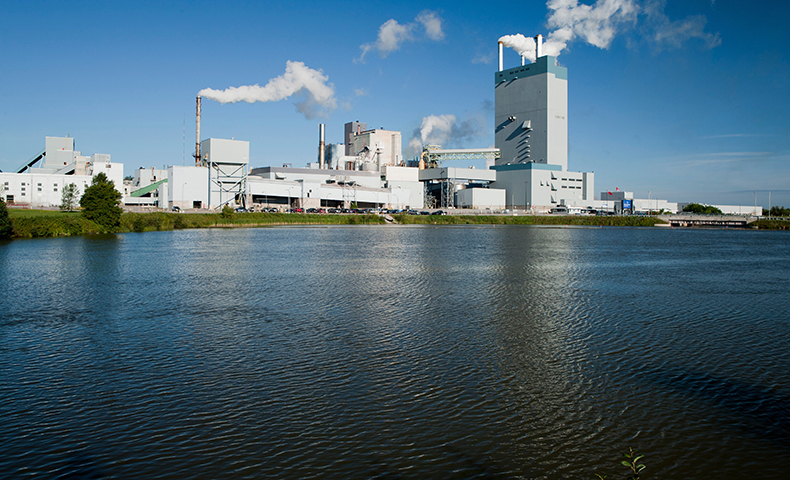 In addition to using filtered water in our pulp- and paper-making processes, we send some of it through an additional purification process to prepare it for making steam in our power and recovery boilers. These boilers require ultra-pure water that is free of dissolved solids, including minerals such as calcium, iron, magnesium and manganese. These minerals can cause corrosion and scaling in our boilers and steam systems, which can decrease their efficiency. We remove minerals through an ion exchange process in a demineralizer plant or a reverse osmosis system. The demineralizer plant uses chemicals, such as caustic and sulfuric acid, to remove the minerals from the water. This demineralized water is now nearly ready for use in the boiler. But first, additional chemicals are added to protect the boilers and steam systems. After heating, what is now known as feed water turns into steam for generating electricity and heat for various mill processes. After we use the steam, our systems recover most of it and condense it back into feed water (condensate), which requires minimal conditioning before it is reused in the boilers. After several rounds of recycling, about 90 percent of the water we use in the mill heads back to the lakes and rivers from which it came. But first, we treat it to ensure that it’s safe for aquatic organisms and other downstream water users. All Domtar mills have an on-site wastewater or effluent treatment plant to clean and reclaim mill effluent. The plant removes the fiber, minerals and other chemicals added to the water in the pulp- and paper-making process. Each mill has a site-specific permit that identifies the water quality levels that must be attained before the water can be sent back into the river, based on federal, state and provincial water quality standards and other local conditions. The first stage of the treatment process, called primary treatment, settles and separates solids (mainly fiber) from the water. This process takes place in a clarifier or a lined settling pond. In the secondary or biological treatment stage, we remove organic substances that could compete with aquatic organisms for dissolved oxygen in rivers and streams. Bacteria and other microbes (collectively called bugs) do the bulk of the work in this stage. And to keep the bugs happy, we add oxygen by mechanically churning the water or by blowing in compressed air. Sometimes we also add nutrients, such as nitrogen or phosphorus, to keep the bugs healthy. This stage is a balancing act of adding and removing substances. The bugs eventually die and settle out as secondary solids in a final settling basin, such as a clarifier or a lined settling pond. This clearer, cleaner water — with most of the solids and organic substances removed — can be returned to rivers and lakes so fish, wildlife, communities, farmers and other industries can utilize this shared resource. The solids that have been removed from the effluent treatment process also are being put to good use. In 2017, Domtar’s mills beneficially reused 78 percent of the solids removed from our effluent treatment systems to improve the productivity of farmland and forests, make compost, provide daily cover for municipal landfills and provide energy for our boilers. As you can see, our mills do a lot of work to screen, chemically treat, filter, heat and pump water so it is ready for use in our pulp- and paper-making processes. And for the water that can’t be reused in our mills, we remove process materials and chemicals so we can return it to the watershed with no adverse effects. Through effective water conservation and management, we can protect this precious natural resource. While most of our mills pay little to no fees to access water, the cost to process water for use and reclaim it for return to the environment is anything but free. By assigning a cost to using water, we can further improve the way we manage this vital resource. We recently developed a model to help our mills understand the full cost of using water. This helps our managers make smarter decisions that can lower our manufacturing costs and water access risks through additional water conservation measures. Previously posted on Domtar's Newsroom.